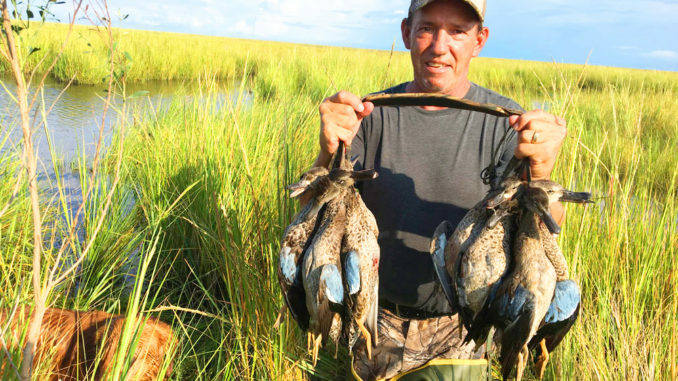 Mississippi’s teal season kicks off Saturday, Sept. 15. Staying mobile and targeting public lands with shallow water will improve your odds of success. Though some will simply head to their favorite blinds and hope for the best on Sept. 15, hunters with the ability to move around a bit would do well to put in some scouting time for best odds on opening day. With the abundance of public hunting acreage in our state, there’s plenty of room to move around to find habitat where the birds will congregate. Keeping a few key points in mind will help you reduce your mileage by focusing your efforts in promising areas. The blue-winged teal’s diminutive size is a major factor in its feeding habits, so hunters should be thinking shallow when looking for areas where the birds might congregate. Early-arriving teal prefer to feed on the surface or on resources just below the surface, as their smaller bodies are unable to reach food at the bottom of deeper ponds. Before setting out, use aerial imagery to identify broken marshes and other areas where the water appears to be shallower than average. In your area, shallow might mean a mud flat flooded at certain times of the day or a lowland area that might be flooded only seasonally _ or even a pasture flooded from recent rains. But if you can find a local food source, you’re likely to catch them coming in to feast. One way to identify shallow, feeding areas is to seek out congregations of wading shorebirds. Arriving blue-wings will often use the same habitat as the shorebirds, as both prefer a similar water depth. The presence of local mottled ducks is also a good indicator that duck-friendly food is available. Teal often feed on seeds and small invertebrates, but will also eat some aquatic grasses such as algae and various weeds. Some of the best hunting I’ve enjoyed during the September season was in an area where native grass had been flooded with high tides and was dropping seeds into the water. It was no wonder that we found birds full of those seeds when we cleaned them after the hunt. X marks the spot — or does it? Though a shallow feeding spot may define the proverbial “X”, that’s not to say straps can’t be filled by hunting nearby. During the 2017 season, I was successful hunting a pond that was 3 feet deep — but it was adjacent to some shallows matted with aquatic grasses. If just next to the “X” affords better concealment and/or easier access, set up there and rely on calling and decoys to sway the birds over for a look. As always, never be afraid to move if your initial setup appears out of the game. Teal are as apt as any bird to be here today and gone tomorrow — so staying mobile will help keep your barrel hot throughout the 16-day season. TIP: If you’re using Google Earth to scout, use the historical imagery tool to review past images, as some might have been taken during low water conditions in the marsh — thus highlighting mud flats or areas that are particularly shallow.